By way of explanation for the lack of a blog post in a while, I also want to write a tribute here to my beloved grandmother who passed away in the early hours of February 3rd. Bridie Smith (nee Murphy) battled most of her life against injustice and came through some serious illnesses that should have knocked her down, only she was an incredibly strong woman. She outlived her eldest son, Frank, which absolutely broke her heart but she kept going. In the end, we were lucky we had her in our lives as long as we did (her 90th would have been in two weeks). We were also lucky that she didn’t suffer. A flu virus turned into pneumonia and her heart just wasn’t strong enough to fight it. Although it all happened in one week and it felt so sudden, the whole family had a chance to spend time with her in the hospital, for the short few days she was in there, and we all got to tell her one last time that we loved her to bits. For my entire life, she was a big presence and had a much greater influence on me than I realised (I look at the odd bit of cardboard or plastic that’s getting thrown away and think (“sure there’s nothing wrong with that, it’ll come in handy someday!”). It was Bridie who passed on her love of music, especially Opera, and her desire to get up to the mountains and out to the countryside as often as possible, to her kids and then to her grandkids. I feel exceptionally proud and so very grateful that these passions of hers are now mine. 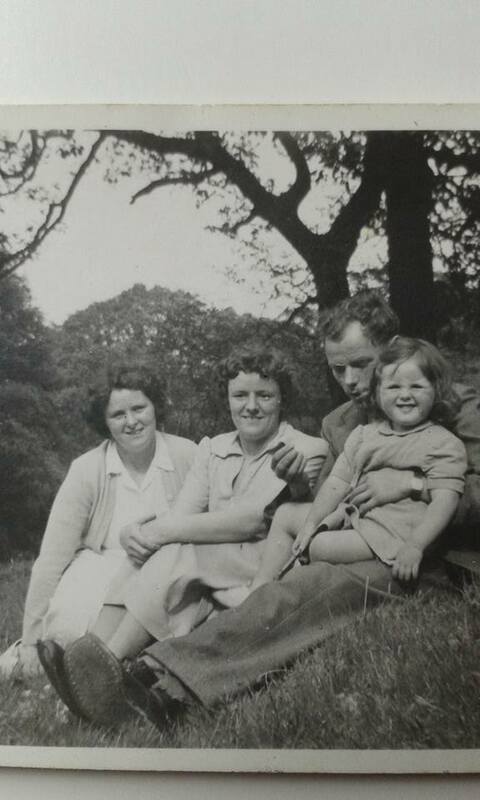 Her upbringing was hard and poor as was every child’s growing up in the tenements in 1930’s Dublin but it didn’t stop her laughing, singing and minding everybody around her that she possibly could with pure love. Her involvement in the struggle for justice in Northern Ireland included years of opening her home to armies of people who needed shelter and safety during the Troubles. Her generosity, her kindness, her fighting spirit and homemade chips are famous! Her politics came from her da, Barney Murphy who fought in the Easter Rising of 1916 against the British Army. Bridie was honoured at a ceremony to mark the centenary at the Abbey Theatre where he worked at the time. Here’s an interview with her on Irish national television. I am particularly lucky that, as a result of me, my ma and my brother having to leave home when I was nine, we moved in with Bridie and Bob (my Ma’s parents). Bridie and Bob helped raise us and it was a privilege to be so close to them and continue that close relationship into our adult lives. I helped her make countless bracks and she taught me my first tune on the piano and how to knit my first purl stitch. Bridie explained all the Italian operas to me line by line (she knew all these from her childhood, saving up with her sister for the cheap seats in the Opera theatre) and helped me with my Irish homework every day after school. We were in bunk beds in the front bedroom back then and every night without fail she told me stories until I fell asleep. Bridie brought us grandkids to her favourite marketplace in Dublin, “The Hill”. A mad collection of stalls and piles of clothes and random stuff all along the street, we went home laden down with more dressing-up clothes a bunch of kids could ask for. All of her hoarding, to us, was a pure treasure trove of fun and she was the best craic, full of divilment and always coiling-up laughing. On our holidays in Allihies in West Cork, we collected winkles down on the beach for her to eat and went on all-day hikes with her. We braved the walk to the shops in the late evening, fearing we’d bump into the village scary oul fella “Bat” so we could buy her lionbars. All of these memories are beyond precious to me. There are no words that can describe how grateful I am, and all of us are, that Bridie had my ma’s care and devotion throughout it all. This also meant that because I was living there, on and off for those 20 years, I got to spend nearly a lifetime with Bridie, sharing laughs, cups of tea, scratches on the back and loads of episodes of “Upstairs, Downstairs”, “M*A*S*H and “Homefront”. I’ll miss you fierce ya mad thing, especially the laughs.